Trunks are some of the oldest, most versatile and useful furniture pieces ever invented. People have been using them for storage and for carrying their possessions during transport since pre-medieval times. The first trunks made in the U.S. appeared in the late 1700s. They were wooden and covered with hides such as deer, horse, sealskin, or cowhide. Then people began to embellish them with handmade brass tacks, forged iron locks and handles and leather trim. Round trunks became popular during the late 1700s and early 1800s while leather covered trunks with “studs” and “buttons” became trendy in the late 1840s and 1850s. All throughout, trunks have evolved in many different styles that vary in shapes, size, and material. They served many different purposes with some specially made for the circus, for salesmen, musical instruments, and tools. Storage options are very important, especially when you are living in an environment that has limited space. You need to be able to tuck things away to keep them safe but you also need them to be out of your way. If you’re similar to most people, then you probably own a whole lot of stuff. It’s amazing how people can accumulate things so quickly and you need to have the right storage option so that your home doesn’t seem too cluttered. Perhaps the best way to deal with this situation is to purchase something similar to a storage trunk. These storage trunks are really convenient as they will be able to house different items for you to keep them safe. It will be easy to access your storage trunk at any time and you will be able to tuck it away somewhere that is out of the way. Many people like to incorporate these storage trunks into their décor but you can also put it in a closet if you would like. If you have items that are getting in your way and you don’t use them all of the time, then it makes sense to put them in a storage chest. You could be a big fan of collecting books but you may not have the room to display all of them on the bookshelf. Putting them into the storage chest will allow you to keep them protected while eliminating some excess clutter. When the time comes where you have more space in your environment to display them, you will be able to bring them out once again. This will work for any extraneous items that you have sitting around your home. Whether you wish to store extra clothing items, personal effects, old toys, or anything else, a storage trunk is going to work great. You can purchase one of these at a very reasonable price and you will immediately see how handy it can be. People who want to be able to have great storage options without taking up too much space need to get creative. One of the most interesting ways that you can do that is to incorporate your storage trunk right into the fabric of your living room design. It is possible to buy a storage trunk that will double as a very nice-looking coffee table. This will give you the storage that you need while also providing the essential function of being a coffee table. This coffee table storage trunk looks really good and you will love making use of it just as you would a typical coffee table. It just has the added benefit of being able to provide you with ample amounts of storage. The types of things that you will want to put inside of this storage trunk will be completely up to you. Some people like to store all of their board games and other fun items such as that inside these storage trunks. It can also be a perfect storage spot to put extra bedding. You might have house guests come over on occasion and you might wind up having someone sleep on your couch during those times. Having the extra bedding right there in your coffee table storage trunk makes getting them ready to sleep much simpler than it would be otherwise. Plus, you need a place to put that extra bedding anyways. Coffee table storage trunks are made to be quite durable so this is a piece of furniture that will be able to stand the test of time. You will be able to make great use of this item as a coffee table for years to come. It will give you plenty of convenient storage options as well. This is a great item that will definitely prove to be useful to you over the years. Storage trunks are great but some of them are too heavy to be able to move around reliably. This can be a bit inconvenient if you want to be able to move it around from room to room. Luckily, there is no reason for you to try to pick up a heavy storage trunk and injure your back in the process. You can simply seek out a rolling storage trunk and make things significantly easier on yourself. These rolling storage trunks are very versatile. You can use them for a variety of different purposes and they will be handy for storing whatever items you need to tuck away. Whether you are looking to store important equipment or you simply need to get some household items put away somewhere neatly, this storage trunk will work great. The wheels on this storage trunk make it very simple to move it around to different rooms, too. When you have wheels on this type of a storage trunk, it makes the transportation so much better. You won’t feel the need to reach down and pick it up. The rolling of this storage trunk is quite smooth overall. Even when you pack it full of items that are quite heavy, it won’t feel too difficult to move once you get it rolling. Having a few of these rolling storage trunks could definitely be useful to you. If you have many things in your closet that need to find a home in some type of storage container, then this is a great option. You will be able to move it easily and access the storage trunk is simple, too. Best of all, you can throw a lock on this to keep really important items safe from harm. Most people own a whole lot of different blankets. You likely have far more blankets than you will ever need at once. This means that you need to store those blankets somewhere so that they won’t be in the way. They’re good to have around for when company comes over or when the weather outside gets incredibly cold. It would be a good idea to seek out a convenient storage option such as a blanket storage trunk. 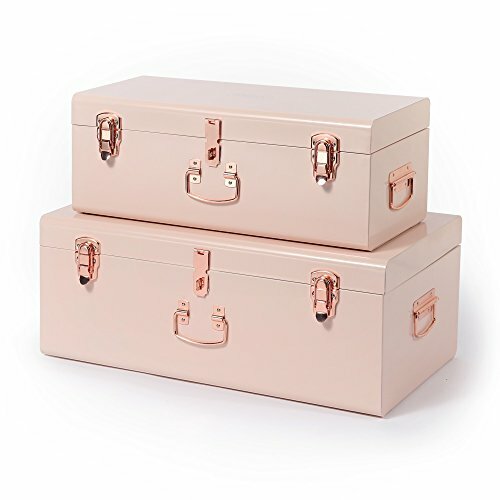 These storage trunks differ from normal storage trunks by being made a bit larger. They are meant to accommodate several blankets and they work excellently for that purpose. If you need a handy spot to be able to put three or maybe even four blankets, then this storage trunk is going to be perfect for you. The storage trunk itself looks really nice. It has a very eye-catching design and it will fit in well no matter what type of interior design style you are going for. In many ways, it just looks as if it is a normal table or piece of furniture that you would keep in your living room. It won’t stand out as being odd in your living room so you will love incorporating this into your setup. You can also use the top of this storage trunk to place some decorations. Family photos or a decorative vase would look very nice on top of this storage trunk. When you need to access the storage trunk to get to the blankets that you have placed inside, it will be easy to set the items down in order to open it up. This is a highly recommended purchase for those who want a highly functional storage trunk that will work well in their existing living space. Of course, Victorian-style storage trunks are one of the first images that you conjure up when thinking of this type of storage option. In many ways, Victorian storage trunks resemble classic treasure chests that you would see in a video game or an old movie. Their appearance is really the main reason why people purchase them. They just look really neat and allow you to add a lot of charm to whatever room you are deciding to put it in. This storage trunk will function very well as a storage option too, though. You can fit all sorts of things inside of this type of a storage trunk. Many people choose to store excess clothing in these storage trunks as it can be a convenient way to get it out of the way. You likely own many clothes that are only useful during particular seasons so storing winter coats and other such items in here during the summer is sensible. If you like Victorian décor and furniture, then this piece will go perfectly in your living room or bedroom. You can use it to store extra items and it will fit in with the rest of your furniture nicely. Whether you are using it to store throw pillows or simply putting little odds and ends inside, you’ll like having it around. More storage options simply make things easier on you. The interesting look of this type of a storage trunk makes this popular to use in children’s rooms as well. It can easily be made into a toy storage trunk if you so desire. Children who like the idea of having their own treasure chests will relish the idea of having one of these. This is a versatile storage trunk that will make many members of your family happy. Tools are definitely very important to mankind as we use them all of the time to perform important tasks. Without the proper tools, certain jobs just wouldn’t be able to get done in the right way. It’s likely that you own many tools that are meant for different tasks. You need to be able to store them properly to keep them safe and it will also be beneficial to be able to organize them well. For this reason, many people seek out tool storage trunks to keep their tools in. This is especially popular for professionals who need to take their tools with them on large jobs. You can purchase these tool storage trunks and keep them in your truck so you will have easy access to all of the tools that you will need. The tool storage trunk can hold a plethora of different tools and equipment so you will be able to make great use of it right away. Being able to take all of the important equipment that you need with you is essential. When you are able to keep it all organized in a convenient location, it just makes everything that much better. 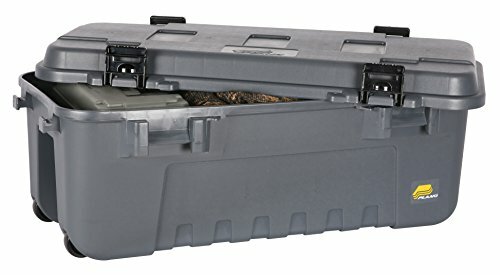 These types of storage trunks are constructed to be as rugged as possible. This particular tool storage trunk is made out of durable steel so you know that your tools and equipment are going to be safe. Storage trunks of this type also feature excellent lock tangs. You can throw a lock on this trunk and keep people from getting into it. Tools are very expensive so you definitely don’t want anyone taking what is yours. If you decide to purchase one of these, then you will be able to feel confident that you can keep all of your important tools and equipment safe. If you are the type of person who enjoys spending time in the great outdoors, then it might be beneficial to purchase a camping storage trunk. These camping storage trunks are very rugged and will be able to fit all of your equipment safely. When you’re out camping, you need to be able to access your gear whenever you need it. This type of storage trunk is pretty easy to tote around and it will keep all of your important gear safe from the elements. Many people use camping storage trunks to keep a spare change of clothes handy. They also like to put essential provisions in there as well as equipment that is going to need to be kept safe. Some of your equipment may not react well to getting wet so you need something such as this to act as a barrier. Luckily, a good camping storage trunk isn’t too costly so you will be able to get one of these very easily. It will definitely be useful when you’re out camping and you won’t have any problems fitting this in your vehicle. It should be noted that some people buy these camping storage trunks to take with them when they are hunting as well. It can be a convenient way to store gear that you may need. Fitting bottles of scent, ammunition, and other essentials inside of this storage trunk will be very simple. It has a good latch and it even has wheels that allow you to transport it quite easily. It has been mentioned that being able to incorporate a storage trunk into the design of your living room is quite desirable. You can understand why you would want to be able to hide storage items in plain sight. This makes it a lot easier to be able to tuck things away and it helps you to make the most efficient use of your living space. Another way that you can add some storage to your home is to purchase a bench storage trunk. This bench storage trunk will act as a seating option in whatever room that you decide to put it in. This type of a bench storage trunk will look very good in most any type of living room and it will function quite well. It is a durable bench seating option that will be able to come in handy when you have company over. It can also easily double as a footstool option if you are in need of one. You will find that this bench storage trunk has a large amount of storage available inside of it. Tucking away all sorts of items inside of this storage trunk will be easy so you can definitely get creative with what you would like to store. Whether you need to store extra clothes or even something fun such as your games, this is going to work well for those purposes. Having a storage option that doubles as a seat when company comes over is going to be really nice. The overall make of this bench storage trunk is quite remarkable. You will be able to make use of this for many years. It will become an important part of your living room and you will love how convenient it is. Storage solutions such as this help to make life that much simpler and this is a recommended purchase because of that. If you have children, then you are likely aware of how messy they can be. They love to play and they have an uncanny ability to clutter up their rooms with various toys. In an effort to keep things more orderly, it can be smart to buy them something to store their toys in. The best option available to you would be a good toy storage trunk. Sometimes you will hear this being referred to as a toy box or a toy chest but it is all really the same thing. 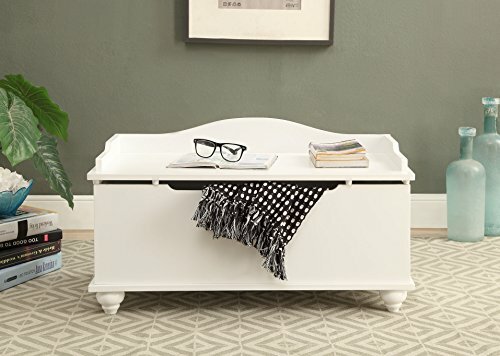 If you purchase a toy storage chest for your child, then he or she will be able to have a fun place where he or she can put all of his or her favorite toys. There are many different options for you to consider when picking out a toy storage trunk so you should be able to find one that will suit the sensibilities of your child perfectly. It may even be possible to find an option that has one of his or her favorite cartoon or video game characters on it, although traditional designs such as the fun hippopotamus on this trunk are nice too. This toy storage trunk is going to be able to fit a whole lot of toys. Depending on how many toys your child plays with on a regular basis, this may be able to fit all of them. If not, then it will definitely fit a large portion of your child’s toys. For the best results, it could be fun to use this toy storage trunk as a way to teach your child about picking up his or her toys. Many parents have made putting toys into these toy storage trunks into a fun game for their children. It can be a way to teach them the value of keeping things tidy and it will help to get them into the habit of cleaning up at the end of the day. 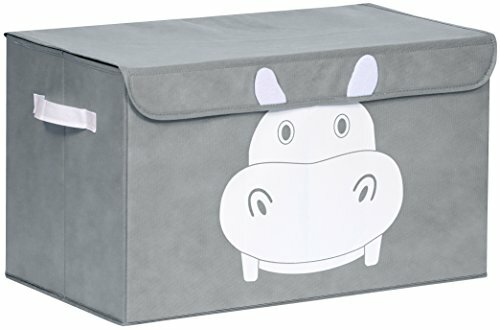 Either way, you will be able to keep your child’s room much more organized when you have one of these toy storage trunks. It will be a fantastic addition to the room and it will keep everything more organized. There are also some storage trunks that are made specifically to be visually appealing. These types of storage trunks will still function well as storage methods but they are meant to be eye-catching pieces that add to the charm of a room. 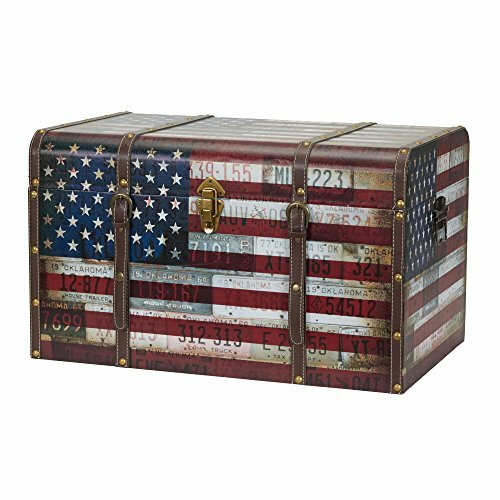 This particular storage trunk is emblazoned with an American flag design. You will be able to find many interesting storage trunk designs that will look great on display in your bedroom. Using things such as this as a way to express yourself can be quite fun. You will be able to have a spot to store your personal belongings that is a little more interesting than a simple dresser drawer. Many people like to put clothing items in these but they can be used for anything. 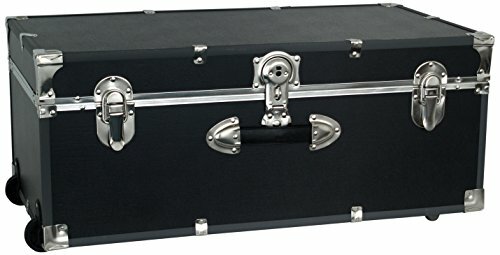 People who collect books, video games, movies, and other similar things often use these decorative storage trunks to house some of their favorite items. You will also find many different types of wicker storage trunks on the market. Wicker furniture has a unique appeal that many enjoy putting on display in their homes. If you have other types of wicker furniture in your house already, then this wicker storage trunk is going to fit right in. This is another good way to add some storage space to your home for various items while fitting in with the décor theme that you are going for. Wicker can be surprisingly strong. You probably won’t want to sit on this type of a storage trunk but it will be durable enough to stand up to regular use. These look really nice and you will love owning one if you are a fan of wicker. You can find these in different colors, too, so take the time to find the option that works best for you.